Technically the usd to cad remains poised in a precarious position, partially supported by the moving averages, but perched on the lower level of the current congestion zone, all of which is providing a mixed picture for us a chartists!! The strong reversal lower on Tuesday suggests that the 1.085 price region has become a significant barrier to any further move higher, and the failure to clear the top side of this price congestion and break above the 1.105 price handle also suggests a similiar theme, with the recent bullish rally now having run out of steam. 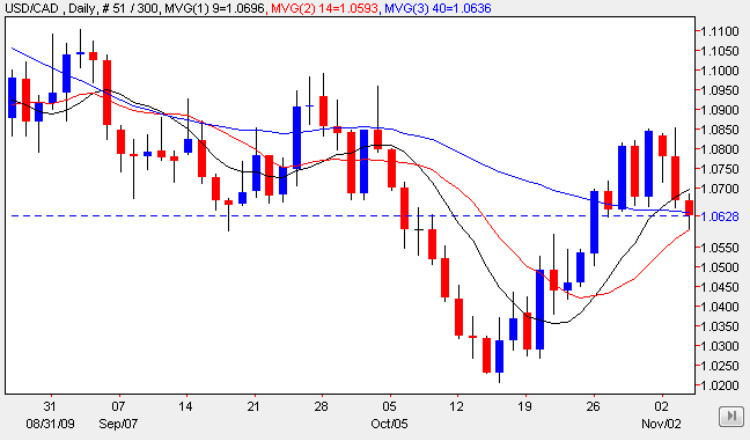 The only positive aspect that one can take from the current chart for the usd to cad is the apparent support currently being provided by the moving averages, but given that these are also in a state of flux at present, the value of such analysis is limited at the moment. In summary then a confusing picture for the usd to cad pair, and only a break and hold above the 1.050 price level will signal that the current rally has reestablished its momentum, with any further fall below 1.055 signalling that bearish sentiment has once again returned to the usd to cad pair, with the prospect of a much deeper move once again. Fundamental news on the economic calendar for the US has focused on the unemployment claims which came in better than expected at 512k while for Canada the IVEY PMI also came in ahead of forecast at 61.2 against a forecast of 60.1. You can keep up to date with all the latest fundamental news on the economic calendar, latest currency news and live currency charts by simply following the links. I have also included details on an excellent ECN broker.